In mid-April, in a recording studio in Los Angeles, a few journalists from around world gathered to hear the album in all its analog glory. Daft Punk's Thomas Bangalter and Guy-Manuel de Homem-Christo lead a formidable, though varied, cast on Random Access Memories, but like all great conductors, they coax the best out of their guests, and the performance is as seamless as it is satisfying. The album features more classic verse-chorus song structures than any Daft Punk album to date (even Discovery), but it's also their most epic, punctuated by maximalist, towering climaxes of sound that provide breathless highs to some of their lengthier tracks. For a better idea of what to expect, read our track-by-track preview of Random Access Memories, below. 1. "Give Life Back to Music (ft. Nile Rodgers [guitar], Paul Jackson, Jr. [guitar])"
A slow, deliberate groove with strong kick drums initiates, with gooey, filtered vocals singing a sweet melody spread overtop. It's already apparent that the robots are more fascinated with classic song structure than ever, but it's when a bridge of hummed, flanged vocals, sounding almost like a violin, kicks in that the song is truly made. The song's melancholy nature is echoed by last words, "I just wanted you to stay." 3. "Giorgio by Moroder (ft. Giorgio Moroder [synth])"
Execs who'd heard the album kept telling me that I "have to hear the Moroder track," and they were right. This is where the album truly begins to define itself. It begins with Moroder speaking about his childhood, about playing guitar, and how he started using synths. With a gentle disco groove under him, accentuating the music of his human voice, Moroder identifies "a sound of the future" (the synth). Then, when he says that he begins "with a click track," things get wild; a click track begins for real, and a Moog melody (VERY Moroder-esque, to be sure) comes in over the same disco background as before. A synth solo at what seems like the end of the song is a nice touch, but when the laid-back groove shifts, becomes almost tropical, and hints of country twang filter in, something's definitely up. Moroder talks for another moment about improvising with synth music — "Nobody told me what to do" — before the track explodes: a string section coda leads back into the same groove, except much bigger, with a bass solo, drum fills, and wailing guitar riffage to top it all off. This is the sound of the new Daft Punk album. It's sublime. 4. "Within (ft. Gonzales [piano])"
But of course, there are moments of tranquility, too. This piano ballad begins with heavily filtered, woozy vocals, and tinkling bells. It's gorgeous, and the most "song-like" Daft Punk track to date; think "Something About Us," but with even more tenderness. Gonzales' piano work here is breathtaking, but it's the lyrics — "There are so many things that I don't understand. I'm looking for someone" — that really tug at the heartstrings. 5. "Instant Crush (ft. Julian Casablancas [vocals])"
You probably never thought of Julian Casablancas' voice as "angelic" before, but so fine is his vocal work here that it wasn't clear it was him until halfway through the song. His soft vocals float over a slowly arpeggiating keyboard riff, which builds to a silver-tongued, yearning chorus, with emphasis on Casablancas' melodic flourishes. A guitar solo near the track's end is sheathed in metallic effects. 6. "Lose Yourself to Dance (ft. Nile Rodgers [guitar], Pharrell Williams [vocals])"
Nile Rodgers lays down a scratchy, groovy guitar intro here. "Lose Yourself to Dance" is more smooth disco, with Pharrell singing the titular phrase in his sugary croon, aided by handclaps. The whole thing happens over more tinkling chimes and a bed of repeated "come on's," all sung in Daft Punk's classic filtered vocals. The "come on's" turn to "yeahs" and build up until everything is stripped away except the handclaps and guitar, emphasizing just how much Rodgers can do with just one riff. Then, when the bass and drums come back in, it's emphatic; the song's chorus repeats one last time, and there's another slow fade-out. 7. "Touch (ft. Paul Williams [vocals and lyrics])"
There's a faint howl of wind and some sparkling synth noodles, and then Paul Williams' voice: "Touch. I remember a touch." The track is a theatrical, Bowie-esque (or Phantom of the Paradise-esque?) ballad for a good chunk of its duration, but then Shaft-ish, wah-wah guitar wicks, and then a string section, come in. As on "Giorgio By Moroder," there's another climax: horn lines, honky tonk piano, disco bass and hi-hat/snare combos fill the speakers. With its acoustic drums and horns, "Touch" is like nothing Daft Punk have done before. Then, it all stops. A slow vocal coda of "hold on," sung with the same sense of yearning that "Within" had, gives way to a quick, chaotic flurry of stringed orchestration, à la "A Day in the Life," before more synth arpeggios and an extended, choral outro: "If love is the answer, hold on." Then, Williams wafts back in, alone, to sing us out. Even amongst these gems, "Get Lucky" is an obvious single; it's hooky, and simultaneously evinces both Daft Punk's leap forward and slight look back. It's virtually perfect, with a killer bass line (that sounds particularly good on quality speakers) and the perfect amount of swagger. If this isn't the sound of the summer, I'll eat my Daft Punk replica helmet. 9. "Beyond (ft. Paul Williams [lyrics])"
A cymbal wash announces a dramatic strings section, and a sailing violin melody. Then, it all fades away to a minimalist, slinky after-hours tune. It's got a nice little melody, sung by (what sounds like) Bangalter using a vocoder. "Motherboard" begins with another slow build: splashy bongos and a staccato bass line begin the track, but a flute and strings provide emphasis. It remains unchanged fairly far into the track, but given the unpredictability of Random Access Memories, and the degree to which it's defined by movements that evoke classical music much more than most modern popular genres, it's hard not to expect a banjo solo, or at least vocals. It ends up more subtle than that: amidst swirling soundscapes, a muted drum solo wows with inflection, as if it's speaking, rather than relying on bombast. Then come the bass drum splashes, and the track's audio compresses and then takes off with a drum-filled jam and a keyboard line, possibly set to harpsichord, that plays the track out in almost baroque style. 11. 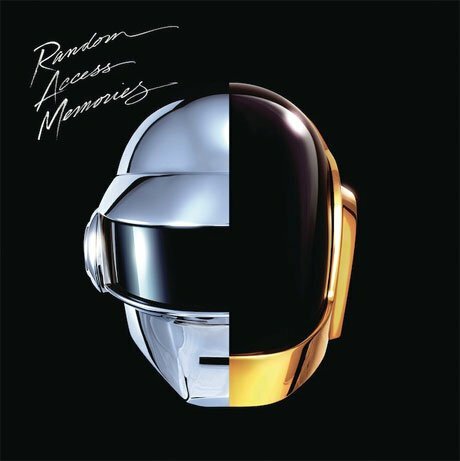 "Fragments of Time (ft. Todd Edwards [vocals])"
The oddest track on Random Access Memories is actually its most straight-up pop jam. "Fragments of Time" returns to the realm of heartbeat-speed disco jams, as Todd Edwards sings "Our only plan is to improvise" over a sunny, top-down tune on which synths mingle with twangy guitar and pedal steel. It could be a Taylor Swift song if it weren't so free of her trademark angst and didn't have a shimmering, sun-dappled guitar solo for a bridge. 12. "Doin' It Right (ft. Noah Benjamin Lennox [vocals])"
The Animal Collective singer appears on a slow jam, with multi-layered, harmonized vocoder voices, repeating "Everybody will be dancing, we'll be doing it right." He provides a classic Panda Bear melody over top, including straight-time, double harmonies with himself. It's exactly what you'd expect — and desire — from a Panda Bear/Daft Punk collaboration, except that, in now-apparent Random Access Memories style, the song is as much suited to a sunny afternoon as to a darkened club. 13. "Contact (ft. DJ Falcon)"
An instrumental track that leaves the listener breathless. "Contact" begins with a sampled voice talking about space, overlaying a Casiotone keyboard bit, but suddenly, it's another all-out jam, with drum fills and synth arpeggios that get heavier as what sounds like a slowly revving jet engine builds tension. The drums continue thrashing away until the "engine" climaxes and falters, crackling away to static. And that's it. Random Access Memories will come out on May 21 through Columbia Records imprint Daft Life Limited.